October 2014 - Gloria Muriel is sponsored by the Mexican Consulate in Sacramento through CEART with Fernando Mendez Corona and Pablo Castañeda to live paint at an art workshop and exhibition. October 2014 - Gloria Muriel paints at Meeting of Styles México. 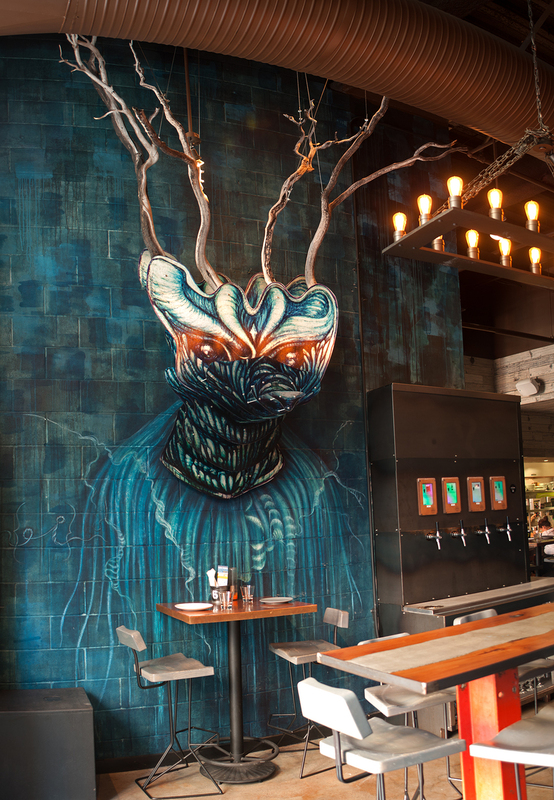 October 2014 - Gloria Muriel paints a hop girl logo for Cerveza Urbana located in Mexicali, Mexico. 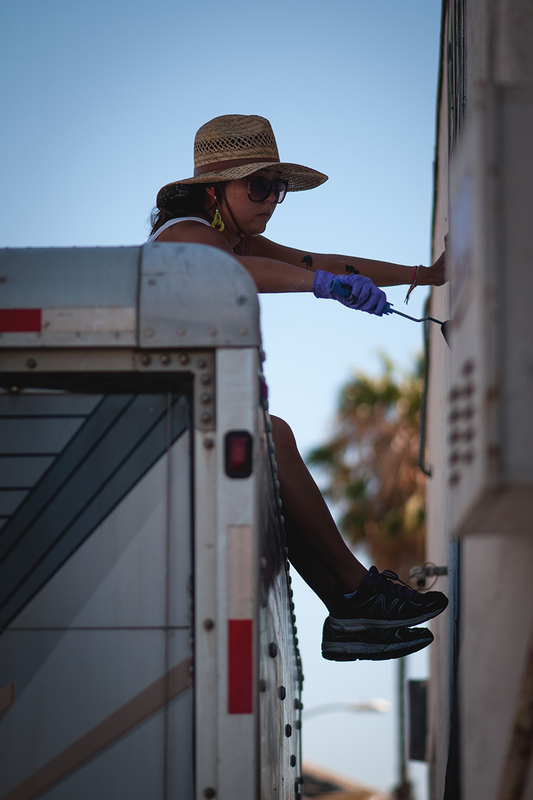 September 2014 - Muralists Gloria Muriel (Glow), Erin Yoshi, Alonso Delgadillo (El Norteño), and Alex Banach collaborate to paint four exterior walls of National City Liquor, in National City, CA. 12 September 2014 - Gloria Muriel presents works at Centro Estatal de las Artes, Mexicali, alongside artist Fernando Corona. 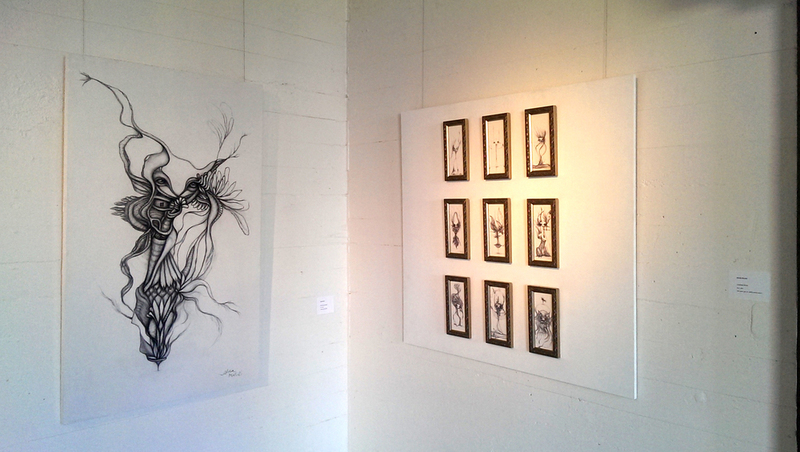 5 June 2014 - Gloria Muriel presents fine art at Bread and Salt Gallery's Group Show 1. 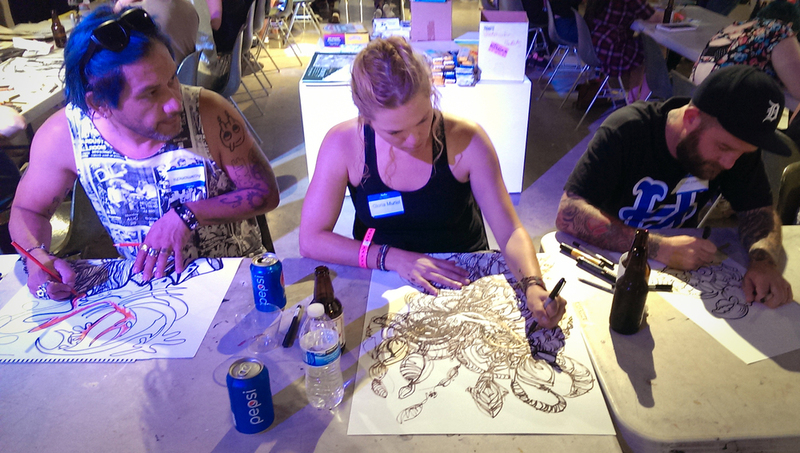 San Diego Art InstituteSeptember 13, 2014 - Gloria Muriel participates in the Monster Drawing Rally at the Museum of the Living Artist, hosted by San Diego Art Institute in Balboa Park. Gloria combines fine art surrealism with the scale of street art to give Común a healing presence. 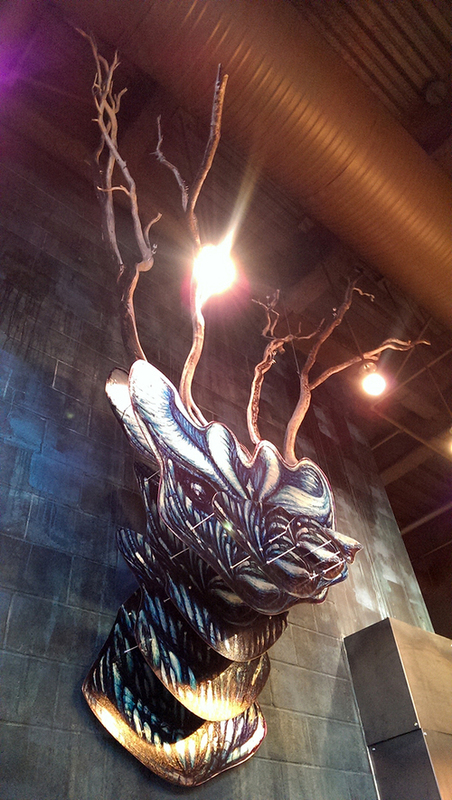 Her work depicts beatific visions of animal and ethereal being; with painted acrylic, brushed metal and reclaimed wood—nature is brought into harmony with the hard edges of industry. The collaborative logo for Gloria Muriel and Alexander Banach is symbolically written in surreal number notation, in which two numbers from the set of reals construct a surreal number by induction. Chef Chad White later appeared as a contestant on Bravo's Top Chef Season 13. Gloria Muriel painted a 16'x120' wall with rollers and brushes for Bread and Salt Gallery in Barrio Logan. The wall was painted in honor of Women's Month, March 2014. January 18, San Diego, CA.- Thumbprint Gallery in La Jolla presents "More Than Grounded" a collection of new works by artist Gloria Muriel. 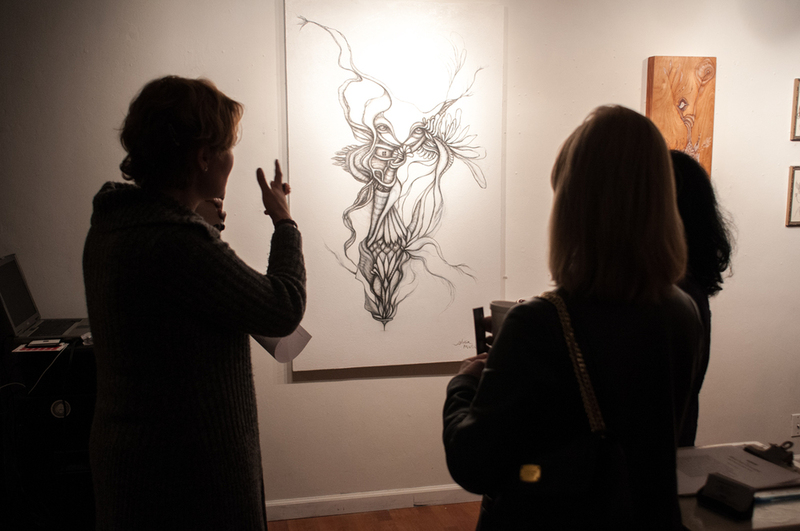 The opening reception will be at Thumbprint on February 8 from 5pm - 10pm. Works will be exhibited through March 2. So if you're down there stop and say hi. October 2012, San Diego, CA.- Great collaboration wall with Maxx Moses at Cirello Gallery in North Park, San Diego. Most of the work was done during night time. I have to say you get to meet interesting people roaming the streets during late hours of the night . 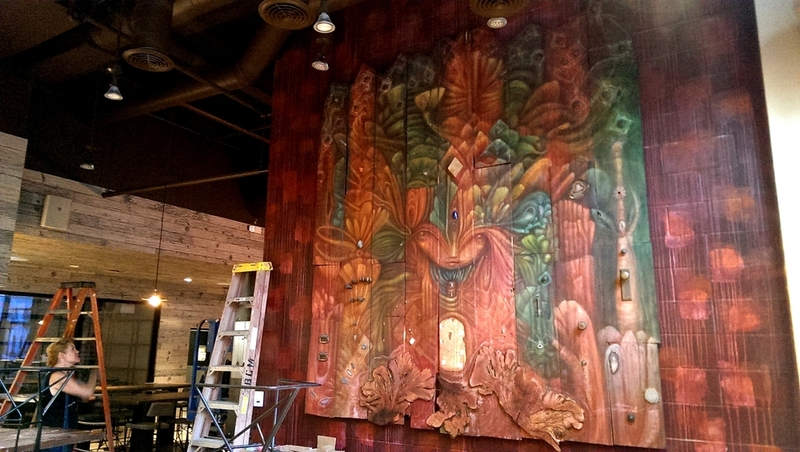 September 2012, San Diego, CA.- While painting the wall at French Gourmet, Anne a resident of the same neighborhood asked for a commissioned wall for her kombucha business. I asked my good friend Monstrinho to help me with the background and this was the result. September 2012, San Diego, CA.- Final session with Monstrinho and Michael Haff to finish Azalea Park, a neighborhood community within City Heights in the greater San Diego, California area. This wall started around August of last year (2011) when a friend Marisa Gallego mentioned she had a wall at her neighborhood that was vacant, I then called Monstrinho and we decided to do a collab. Since that time the wall has recorded the talents of other great artists like Beth Emmerich, Tecui and Eloaf.The community has been very receptive to the wall and locals are now talking of declaring it as the official community art passage. September 2012, Tijuana, BC. Mexico.- September I was very happy to get a visit from a good friend of mine Tanya Mensen, while on her visit we decided to take our talents and those of others south of the border. The initial plan (if there ever was one) was to enjoy a quiet day painting in Tijuana, it ended up being a great collaboration between five individuals connecting with the community in a live setting using art as the communicating tool. Thank you to all the participating artists Michael Haff, Monstrinho, Tanya Mensen and our Tijuana wall scout El Norteño, thank you friends for a great time. Also thank you to the family who donated this amazing wall can't remember their names but THANK YOU. In case you care to visit, the wall is located in La Colonia Soler in Tijuana. Early this month I had great time donating a hat to the Autism Tree Project Foundation for they're 19th Annual Hats Off to San Diego Luncheon. This year's theme was "A Salute to Broadway" so I came up with an according head piece which included a stage, curtains, jazz hands and of course lights. I would like to thank everyone at ATPF for the invite had a great time. Great friend and artist Monstrinho and yours truly will be showing our work at ZANZIBAR Café located on 976 Garnet Ave San Diego CA 92109 | 858.272.4762 | zanzibarcafe.com. Opening day is June 6th at 7PM, there will be a special guest performance by Tracey Stockalper.